It has been three years since Fatou Bensouda assumed her position as chief prosecutor of the International Criminal Court (ICC). When the Gambian lawyer took over the post from Luis Moreno-Ocampo, it was widely believed that she would strike the right balance between continuity and change. While Bensouda had been Moreno-Ocampo’s loyal deputy prosecutor, her election also held out the promise of a shift in tone and substance. One-third of the way through her tenure, there has been a palpable and seismic shift in the atmosphere within the Office of the Prosecutor (OTP). It is more open and transparent. It is a less hostile institution to outsiders, and there’s an absence of distracting and salacious rumours swirling through the Office’s halls. While the Court can never avoid media attention – and it shouldn’t – there has not been a single instance when Bensouda has brought disrepute or embarrassment to her Office. But here’s the catch: it still isn’t clear what the defining features of Bensouda’s tenure are or will be. Consider this: with the exception of indictments issued for Jean-Pierre Bemba and his legal team on what amount to counts of obstructing justice, Bensouda’s office has yet to issue a single arrest warrant in three years. What explains this recalcitrance? One hypothesis that certainly can’t explain the lack of new arrest warrants is opportunity. Under Bensouda, a number of official investigations have been launched, including in the Central African Republic and Mali. Preliminary examinations have also been opened in Ukraine and Palestine. Moreover, ongoing examinations have inched towards official investigations in Afghanistan and Iraq. The results of these decisions could very well come to define Bensouda’s tenure, but they haven’t yet. Still, these various interventions and potential interventions do point to an Office that has its fingers in a number of different pies and that isn’t lacking for work. Relatedly, it is impossible to explain any decision made by the OTP without reference to the Office’s resource constraints. The OTP has a smaller budget than organisations like Human Rights Watch or Amnesty International and it is either at, or very close, to its maximum case and trial capacity. Taking many more cases would require a dilution of resources that would hinder the justice and accountability the Court can hope to deliver. Still, the ICC doesn’t always have control over when its docket fills up. 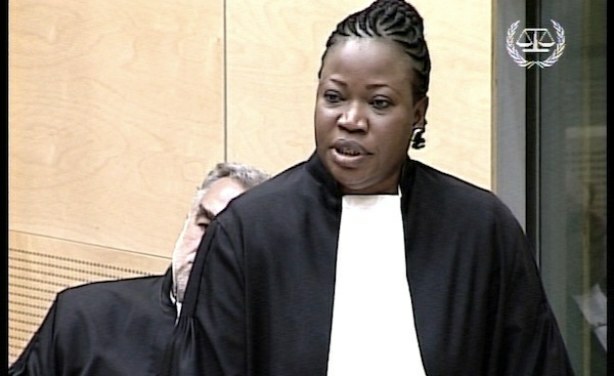 During Bensouda’s tenure, the Court surprisingly managed to get its hands on a number of suspects, mostly notably the Lord’s Resistance Army commander Dominic Ongwen, the former Democratic Republic of Congo rebel leader Bosco Ntaganda, and former President of the Ivory Coast Laurent Gbagbo. In other words, Bensouda’s hands have been full as her office enjoys the fruits of the Moreno-Ocampo era’s labour. Of course, we can’t dismiss the mess of an institution that Bensouda inherited and, as the former deputy prosecutor, she has some responsibility for this situation. There is widespread recognition that the OTP under Moreno-Ocampo prioritised the impact of having arrest warrants issued over building cases strong enough to result in convictions. In Libya, the Court issued arrest warrants within just a matter of weeks of opening an official investigation.There have long been questions about the strength of the evidence against the prosecutor’s targets there. As a result of hastily constructed cases, the ICC’s first-ever trial – that of Thomas Dyilo Lubanga – almost collapsed on two occasions. At the same time, even if allegations of witness intimidation prove to be true, the case of Uhuru Kenyatta also collapsed in late 2014, at least in part because the structure of the case against the Kenyan President was weak. Meanwhile, the Court’s highest-profile targets have escaped justice. If this week is any indication, there is little prospect that Sudan’s recently re-elected President Omar al-Bashir, indicted for all three of the ICC core crimes (war crimes, crimes against humanity, and genocide) will ever face trial in The Hague. If he is alive, Joseph Kony, the notorious leader of the LRA, also seems unlikely to face judges at the Court. While it is obvious that the ICC is inevitably dependent on states to enforce its indictments and that international cooperation often remains wanting, unenforced warrants for major perpetrators undermine the Court’s perception, relevance and legitimacy. But how do poorly constructed cases and ICC fugitives help us explain the tone of Bensouda’s tenure? Under the current prosecutor, there has been a subtle but crucial change in strategy. Instead of rushing into issuing arrest warrants, the focus has returned to building strong cases and, if possible, trial ready cases, before pursuing indictments. Moreover, there is very little appetite within the ICC to issue arrest warrants that have no hope of ever being enforced by states. Here, it is noteworthy that there are whispers that the Court may have sealed warrants of arrest which, would presumably only be unsealed when an ICC target comes into circumstances where the likelihood of enforcement is high. Taken together, all of this is indicative of an OTP that is exercising caution and care in how it builds cases and in who it targets. There will always be an irresolvable tension between the need to achieve accountability as soon as possible and the fact that rushed justice is almost invariably bad justice. Somewhat ironically, although quite predictably, the ICC’s brief history suggests that trying to achieve justice quicker leads, in the worst case, to impunity and, in the best, to long-drawn out trials hobbled by delays and near-collapses. Patience isn’t easy to come by in the world of international criminal justice. The hope is that the OTP’s more calibrated, careful strategies will ultimately pay dividends. There’s a lot at stake. And patience isn’t an unlimited resource. This article was originally posted at Justice Hub where I have a regular bi-monthly column. This entry was posted in Fatou Bensouda, ICC Prosecutor, International Criminal Court (ICC), International Criminal Justice, Luis Moreno-Ocampo. Bookmark the permalink.